এছাড়াও বেদান্ত অনুসারে তিনিই র মহা ঈশ্বর । শ্বেতাশ্বতর উপনিষদে বলা হয়েছে - "যদাহতমস্তন্ন দিবা ন রাত্রির্নসন্ন চাসচ্ছিব এব কেবলঃ।"
To what extent Śiva's origins are in fact to be sought in Rudra is extremely unclear. 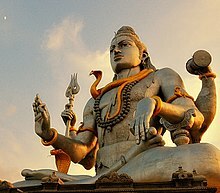 The tendency to consider Śiva an ancient god is based on this identification, even though the facts that justify such a far-reaching assumption are meager. The fire myth of Rudra-Śiva plays on the whole gamut of fire, valuing all its potentialities and phases, from conflagration to illumination. গঙ্গার মর্ত্যে অবতরণকালে শিব তাঁকে জটায় ধারণ করছেন; সম্মুখে পার্বতী, নন্দী ও ভগীরথ, সন্ত নারায়ণের হিন্দি পাণ্ডুলিপির চিত্র, ১৭৪০ খ্রি. Through these transcendent categories, Śiva, the ultimate reality, becomes the efficient and material cause of all that exists. ↑ ক খ Flood (1996), p. 17. ↑ ক খ Zimmer (1972) p. 124. ↑ See Parmeshvaranand, Volume 3. ↑ See Kramrisch, The presence of Siva, page 186. ↑ See Abhayananda, page 95. ↑ See Davis, pp 113-114. ↑ See Shiva Samhita, e.g. translation by Mallinson. ↑ Yoga and the Hindu Tradition, Varenne, page 82. ↑ See Marchand for Jnana Yoga. ↑ Davis writes on page 122: "The Saiva worshipper does not worship the object itself as Siva or as representing Siva; he directs his worship toward it as the physical support for Siva's special presence." ↑ Hinduism: Beliefs and Practices, by Jeanne Fowler, pgs. 42–43, In traditional Indian society, the linga is rather seen as a symbol of the energy and potentiality of the god. ↑ See Fuller, The Camphor Flame, pp 58. ↑ ক খ Keay, p.xxvii. ↑ ক খ Macdonell, p. 314. ↑ For use of the term śiva as an epithet for other Vedic deities, see: Chakravarti, p. 28. ↑ For the definition "Śaivism refers to the traditions which follow the teachings of Śiva (śivaśāna) and which focus on the deity Śiva... " see: Flood (1996), p. 149. ↑ Sri Vishnu Sahasranama, Ramakrishna Math edition, pg.47 and pg. 122. ↑ Swami Chinmayananda's translation of Vishnu sahasranama, pg. 24, Central Chinmaya Mission Trust. ↑ This is the source for the version presented in Chidbhavananda, who refers to it being from the Mahabharata but does not explicitly clairify which of the two Mahabharata versions he is using. See Chidbhavananda, p.5. ↑ For an overview of the Śatarudriya see: Kramrisch, pp. 71-74. ↑ For complete Sanskrit text, translations, and commentary see: Sivaramamurti (1976). ↑ For Shiva as a composite deity whose history is not well-documented, see: Keay, p. 147. ↑ ক খ গ Courtright, p. 205. ↑ For Jejuri as the foremost center of worship see: Mate, p. 162. ↑ 'Khandoba: Ursprung, Geschiche und Umvelt von Pastoralem Gotheiten in Maharashtra, Wiesbaden 1976 (German with English Synopsis) pp. 180-98, "Khandoba is a local deity in Maharashtra and been Sanskritised as an incarnation of Shiva." ↑ For worship of Khandoba in the form of a lingam and possible identification with Shiva based on that, see: Mate, p. 176. ↑ For use of the name Khandoba as a name for Karttikeya in Maharashtra, see: Gupta, Preface, and p. 40. ↑ ক খ Flood (1996), pp. 28-29. ↑ For a drawing of the seal see Figure 1 in: Flood (1996), p. 29. ↑ For translation of paśupati as "Lord of Animals" see: Michaels, p. 312. ↑ Flood (2003), pp. 204-205. ↑ ক খ Michaels, p. 216. ↑ For dating based on "cumulative evidence" see: Oberlies, p. 158. ↑ For Śarva as a name of Shiva see: Apte, p. 910. ↑ For archer and arrow associations see Kramrisch, Chapter 2, and for the arrow as an "essential attribute" see: Kramrisch, p. 32. ↑ For root śarv- see: Apte, p. 910. ↑ ক খ Chidbhavananda, p. 33. ↑ For translation of Bāṇahasta as "Armed with arrows in his hands") see: Sharma 1996, পৃ. 294. ↑ For Shiva being identified with Agni, Indra, Prajāpati, Vāyu, and others see: Chakravarti, p. 70. ↑ For general statement of the close relationship, and example shared epithets, see: Sivaramamurti, p. 11. ↑ For an overview of the Rudra-Fire complex of ideas, see: Kramrisch, pp. 15-19. ↑ For quotation "An important factor in the process of Rudra's growth is his identification with Agni in the Vedic literature and this identification contributed much to the transformation of his character as Rudra-Śiva." see: Chakravarti, p. 17. ↑ For translation from Nirukta 10.7, see: Sarup (1927), p. 155. ↑ For "Note Agni-Rudra concept fused" in epithets Sasipañjara and Tivaṣīmati see: Sivaramamurti, p. 45. ↑ For the parallel between the horns of Agni as bull, and Rudra, see: Chakravarti, p. 89. ↑ For flaming hair of Agni and Bhairava see: Sivaramamurti, p. 11. ↑ For text of RV 2.20.3a as स नो युवेन्द्रो जोहूत्रः सखा िशवो नरामस्तु पाता । and translation as "May that young adorable Indra, ever be the friend, the benefactor, and protector of us, his worshipper" see: Arya & Joshi (2001), p. 48, volume 2. ↑ For text of RV 6.45.17 as यो गृणतामिदासिथापिरूती िशवः सखा । स त्वं न इन्द्र मृलय ॥ and translation as "Indra, who has ever been the friend of those who praise you, and the insurer of their happiness by your protection, grant us felicity" see: Arya & Joshi (2001), p. 91, volume 3. ↑ For translation of RV 6.45.17 as "Thou who hast been the singers' Friend, a Friend auspicious with thine aid, As such, O Indra, favour us" see: Griffith 1973, পৃ. 310. ↑ For text of RV 8.93.3 as स न इन्द्रः सिवः सखाश्चावद् गोमद्यवमत् । उरूधारेव दोहते ॥ and translation as "May Indra, our auspicious friend, milk for us, like a richly-streaming (cow), wealth of horses, kine, and barley" see: Arya & Joshi (2001), p. 48, volume 2. ↑ For Shiva as depicted with a third eye, and mention of the story of the destruction of Kama with it, see: Flood (1996), p. 151. ↑ For a review of theories about the meaning of tryambaka, see: Chakravarti, pp.37-39. 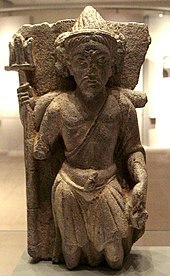 ↑ For usage of the word ambaka in classical Sanskrit and connection to the Mahabharata depiction, see: Chakravarti, pp. 38-39. ↑ For translation of Tryambakam as "having three mothers" and as an epithet of Rudra, see: Kramrisch, p. 483. ↑ For vedic Sanskrit meaning and "having three mothers" as the translation of Max Müller and Macdonell, see: Chakravarti, pp. 37-38. ↑ For discussion of the problems in translation of this name, and the hypothesis regarding the Ambikās see: Hopkins (1968), p. 220. ↑ For the Ambikā variant, see: Chakravarti, pp. 17, 37. ↑ For the moon on the forehead see: Chakravarti, p. 109. ↑ For śekhara as crest or crown, see: Apte, p. 926. ↑ For Chandraśekhara as an iconographic form, see: Sivaramamurti (1976), p. 56. ↑ For translation "Having the moon as his crest" see: Kramrisch, p. 472. ↑ For the moon iconography as marking the rise of Rudra-Shiva, see: Chakravarti, p. 58. ↑ For discussion of the linkages between Soma, Moon, and Rudra, and citation to RV 7.74, see: Chakravarti, pp. 57-58. ↑ ক খ গ ঘ Flood (1996), p. 151. ↑ Flood (1996), pp. 92, 161. ↑ Flood (1996), p. 161. ↑ For Kapardin as a name of Shiva, and description of the kaparda hair style, see, Macdonell, p. 62. ↑ For Shiva drinking the poison churned from the world ocean see: Flood (1996), p. 78. ↑ See: name #93 in Chidbhavananda, p. 31. ↑ For Shiva supporting Gaṅgā upon his head, see: Kramrisch, p. 473. ↑ For alternate stories about this feature, and use of the name Gaṅgādhara see: Chakravarti, pp. 59 and 109. ↑ For description of the Gaṅgādhara form, see: Sivaramamurti (1976), p. 8. ↑ For definition and shape, see: Apte, p. 461. ↑ For use by Kāpālikas, see: Apte, p. 461. ↑ For a review of issues related to the evolution of the bull (Nandin) as Shiva's mount, see: Chakravarti, pp. 99-105. ↑ For spelling of alternate proper names Nandī and Nandin see: Stutley, p. 98. ↑ For identification of Mount Kailāsa as the central linga, see: Stutley (1985), p. 62. ↑ For quotation "Śiva is a god of ambiguity and paradox" and overview of conflicting attributes see: Flood (1996), p. 150. ↑ For quotation regarding Yajur Veda as containing contrary sets of attributes, and marking point for emergence of all basic elements of later sect forms, see: Chakravarti, p. 7. ↑ For summary of Shiva's contrasting depictions in the Mahabharata, see: Sharma 1988, পৃ. 20-21. ↑ For rud- meaning "cry, howl" as a traditional etymology see: Kramrisch, p. 5. ↑ Citation to M. Mayrhofer, Concise Etymological Sanskrit Dictionary, s.v. "rudra", is provided in: Kramrisch, p. 5. ↑ Sharma 1996, পৃ. 301. ↑ Sharma 1996, পৃ. 314. ↑ For translation of Mahākāla as "Time beyond time" see: Kramrisch, p. 476. ↑ For the name Kāla translated as "time; death", see: Kramrisch, p. 474. ↑ The name Kāla appears in the Shiva Sahasranama, where it is translated by Ram Karan Sharma as "(The Supreme Lord of) Time". See: Sharma 1996, পৃ. 280. ↑ For Bhairava form as associated with terror see: Kramrisch, p. 471. ↑ For भैरव as one of the eight forms of Shiva, and translation of the adjectival form as "terrible" or "frightful" see: Apte, p. 727, left column. ↑ For adoption of the name Śaṇkara by Shankaracarya see: Kramrisch, p. 481. ↑ For dating Shankaracharya as 788-820 CE see: Flood (1996), p. 92. ↑ For translation of Śambhu as "Causing Happiness" see: Kramrisch, p. 481. ↑ For speculation on the possible etymology of this name, see: Chakravarti, pp. 28 (note 7), and p. 177. ↑ For the contrast beteween ascetic and householder depictions, see: Flood (1996), pp. 150-151. ↑ For Shiva's representation as a yogin, see: Chakravarti, p. 32. ↑ For name Mahāyogi and associations with yoga, see, Chakravarti, pp. 23, 32, 150. ↑ For the ascetic yogin form as reflecting Epic period influences, see: Chakravarti, p. 32. ↑ For Umāpati, Umākānta and Umādhava as names in the Shiva Sahasranama literature, see: Sharma 1996, পৃ. 278. ↑ For Umā as the oldest name, and variants including Pārvatī, see: Chakravarti, p. 40. ↑ For Pārvatī identified as the wife of Shiva, see: Kramrisch, p. 479. ↑ For regional name variants of Karttikeya see: Gupta, Preface. ↑ For description of the nataraja form see: Jansen, pp. 110-111. ↑ For interpretation of the naṭarāja form see: Zimmer, pp. 151-157. ↑ For names Nartaka (Sanskrit नर्तक) and Nityanarta (Sanskrit नित्यनर्त) as names of Shiva, see: Sharma 1996, পৃ. 289. ↑ For prominence of these associations in puranic times, see: Chakravarti, p. 62. ↑ For popularity of the nṛtyamūrti and prevalence in South India, see: Chakravarti, p. 63. ↑ For iconographic description of the Dakṣiṇāmūrti form, see: Sivaramamurti (1976), p. 47. ↑ For description of the form as representing teaching functions, see: Kramrisch, p. 472. ↑ For characterization of Dakṣiṇāmūrti as a mostly south Indian form, see: Chakravarti, p. 62. ↑ For the deer-throne and the audience of sages as Dakṣiṇāmūrti, see: Chakravarti, p. 155. ↑ Goldberg specifically rejects the translation by Frederique Marglin (1989) as "half-man, half-woman", and instead adopts the translation by Marglin as "the lord who is half woman" as given in Marglin (1989, 216). Goldberg, p. 1. ↑ For evolution of this story from early sources to the epic period, when it was used to enhance Shiva's increasing influence, see: Chakravarti, p. 46. ↑ For the Tripurāntaka form, see: Sivaramamurti (1976), pp. 34, 49. ↑ Flood (1996), p. 29. ↑ For five as a sacred number, see: Kramrisch, p. 182. ↑ It is first encountered in an almost identical form in the Rudram. For the five syllable mantra see: Kramrisch, p. 182. ↑ For discussion of these five forms and a table summarizing the associations of these five mantras see: Kramrisch, pp. 182-189. ↑ For distinct iconography, see Kramrisch, p. 185. ↑ For association with the five faces and other groups of five, see: Kramrisch, p. 182. ↑ For the epithets pañcamukha and pañcavaktra, both of which mean "five faces", as epithets of Śiva, see: Apte, p. 578, middle column. ↑ For variation in attributions among texts, see: Kramrisch, p. 187. ↑ Quotation from Pañcabrahma Upanishad 31 is from: Kramrisch, p. 182. ↑ For relatively minor position in Vedic times, and rise in progress by 1000-700 BCE see: Zimmer (1946), p. 125, note 2. ↑ For the rise in popularity of Shiva and Vishnu, and the role of Puranas in promoting sectarian positions, see: Flood (1996), pp. 110-111. ↑ For Visnu becoming Shiva in Vaishnava myths, see: Zimmer (1946), p. 125. 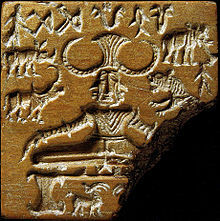 ↑ For Vishnu Purana dating of 4th c. CE and role of Vishnu as supreme deity, see: Flood (1996), p. 111. ↑ For identification of Shiva as a manifestation of Vishnu see: Bhagavata Purana 4.30.23, 5.17.22-23, 10.14.19. ↑ For predominant role of Shiva in some myths, see: Zimmer (1946), p. 128. ↑ For the lingodbhava myth, and Vishnu and Brahmā as emanations of Shiva, see: Zimmer (1946), pp. 128-129. ↑ For translation of the epithet शिपिविष्ट (IAST: śipiviṣṭa) as "salutation to him of the form of Vishṇu" included in the fifth anuvāka, and comment that this epithet "links Śiva with Vishṇu" see: Sivaramamurti, pp. 21, 64. ↑ For Śarabha as an "animal symplegma" form of Shiva, see: Kramrisch, p. 481. ↑ For incarnation in composite form as man, bird, and beast to chastise Narasimha, see: Chakravarti, p. 49. ↑ For Harirudra citation to Mbh. III.39.76f see: Hopkins (1969), p. 221. ↑ For the story of Rāvaṇa and the Mahābaleśvara linga see: Chakravarti, p. 168. Arya, Ravi Prakash & K. L. Joshi. Ṛgveda Saṃhitā: Sanskrit Text, English Translation. Parimal Publications, Delhi, 2001, আইএসবিএন ৮১-৭১১০-১৩৮-৭ ISBN বৈধ নয় (Set of four volumes). Parimal Sanskrit Series No. 45; 2003 reprint: 81-7020-070-9. Chidbhavananda, Swami (১৯৯৭)। Siva Sahasranama Stotram: With Navavali, Introduction, and English Rendering.। Sri Ramakrishna Tapovanam। আইএসবিএন 81-208-0567-4। (Third edition). The version provided by Chidbhavananda is from chapter 17 of the Anuśāsana Parva of the Mahābharata. Hopkins, E. Washburn (১৯৬৯)। Epic Mythology। New York: Biblo and Tannen। Originally published in 1915. Sarup, Lakshman (১৯২০–১৯২৭)। The Nighaṇṭu and The Nirukta। উদ্ধৃতি শৈলী রক্ষণাবেক্ষণ: তারিখ বিন্যাস (link) Reprint: Motilal Banarsidass, 2002, আইএসবিএন ৮১-২০৮-১৩৮১-২. Sharma, Ram Karan (১৯৯৬), Śivasahasranāmāṣṭakam: Eight Collections of Hymns Containing One Thousand and Eight Names of Śiva, Delhi: Nag Publishers, আইএসবিএন 81-7081-350-6 উদ্ধৃতি টেমপ্লেট ইংরেজি প্যারামিটার ব্যবহার করেছে (link) This work compares eight versions of the Śivasahasranāmāstotra with comparative analysis and Śivasahasranāmākoṣa (A Dictionary of Names). The text of the eight versions is given in Sanskrit. Stutley, Margaret (১৯৮৫)। The Illustrated Dictionary of Hindu Iconography। First Indian Edition: Munshiram Manoharlal, 2003, আইএসবিএন ৮১-২১৫-১০৮৭-২. Tattwananda, Swami (১৯৮৪)। Vaisnava Sects, Saiva Sects, Mother Worship। Calcutta: Firma KLM Private Ltd.। First revised edition. Zimmer, Heinrich (১৯৪৬)। Myths and Symbols in Indian Art and Civilization। Princeton, New Jersey: Princeton University Press। আইএসবিএন 0-691-01778-6। First Princeton-Bollingen printing, 1972.